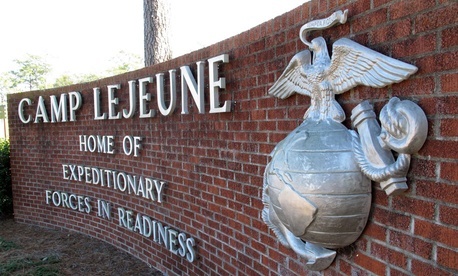 One Marine was shot to death by another Marine at Camp Lejeune in North Carolina earlier today. The incident has been declared "no longer active" by authorities. Details are sketchy thus far and the name of the victim and the shooter have been withheld, but the base's spokesman offered that "the Marine who fired the shot from his M4 rifle was in custody and awaiting questioning by Naval Criminal Investigative Services." The natural logical leap is to connect this incident to the shooting rampage at Fort Hood last week that left three people dead and 16 others wounded. No motive has been established in either incident although the spokesman at Camp Lejeune immediately sought (somewhat unconvincingly) to distance today's shooting with the one in Texas. "It's important that we convey that this is not a Fort Hood-like incident. It was an isolated incident that's no longer active." On behalf of the commanding generals at the base and all Marines aboard Camp Lejeune, this has been crushing for everybody, and our thoughts and prayers are with the families of the victim... It's a tragedy for all of us, and right now, this community is hurting. I know that the prayers of Camp Lejeune are with the victim and their families.